Student startups won a combined $218,000 in seed funding at the third annual Emerging Talk conference on April 12 and 13 in the Whitman School of Management. More than 300 students, faculty, entrepreneurs, investors and community members came out to watch students pitch in several competitions, display their businesses and ideas at Demo Alley and win seed funding to take their ventures to the next level. This year, in the interest of fostering closer collaboration among aspiring entrepreneurs throughout the University community, three startup funding competitions were held together at Emerging Talk. The Raymond von Dran (RvD) IDEA Awards competition is part of the Raymond von Dran Innovation and Disruptive Entrepreneurship Accelerator (IDEA) and has provided seed funding to help student entrepreneurs launch their ventures since 2009. The Panasci Business Plan Competition is a campus-wide student business plan competition, hosted by the Falcone Center for Entrepreneurship, and made possible by a longtime Whitman supporter, the late Henry A. Panasci, founder of Fay’s Drugs. The L.C. Smith College of Engineering and Computer Science’s Invention and Creativity competition offers students the opportunity to pursue entrepreneurial endeavors and encourages students to leverage their education in science and technology to bring their ideas to fruition. This competition was open to any team consisting of at least one L.C. Smith College of Engineering and Computer Science student. Students from SU, SUNY Cortland, Le Moyne College, SUNY Oswego, Colgate University and SUNY-ESF pitched to panels of judges composed of alumni, entrepreneurs and investors. The student teams were composed of an interdisciplinary mix of talent and a diverse range of majors, including civil, mechanical, electrical and bioengineering, political science, finance, fashion design, information management and public relations, to name just a few. Funding is awarded to student companies to cover start-up expenses, including salaries of company owners and employees, space rental and marketing, legal, website and proof-of-concept development. Winning teams from SU will be required to meet with Entrepreneur-in-Residence John Liddy to outline the deliverables, company calendar and business plan, after which they will receive the first half of their funds. They earn the remaining half of the Ray von Dran IDEA Award in six to 12 weeks, based on their work in implementing the plans discussed with Liddy. Many students had product to show judges in the competitions this year. The Ray von Dran IDEA Award and Invention and Creativity Competition recipients were recognized during Emerging Talk, an event that pulled together student entrepreneurs from universities and colleges across Central New York, as well as investors and others interested in entrepreneurship. 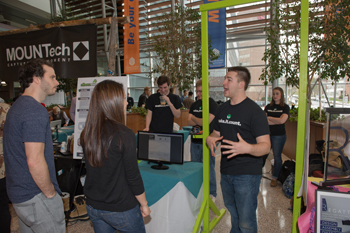 Forty-five student teams took part in Demo Alley, where they had the opportunity to talk about their venture with investors, faculty, students and community members. OneCard won $500 for Best Display, MOUNTech won $500 for Crowd Favorite and the Gambia Lifewater Project won $500 for Best 60 Second Pitch given on Friday evening at Emerging Talk. Emerging Talk was also the site for the New York State Business Plan Competition regionals. The companies listed below denoted with an asterisk have been invited to attend the New York State Business Plan Competition finals in Albany on April 26. Recipe into Reality,* software allowing users to go to their favorite recipe website or blog, choose a recipe that looks delicious and order it from their nearest online grocer, will also be going to the New York State Business Plan Competition in the products and services category. Recipe into Reality was created by Yuni Sameshima (Colgate University, molecular biology, economics). The RvD IDEA Awards and Emerging Talk had many great sponsors this year. The health care track of the RvD IDEA Awards was sponsored by St. Joseph’s Hospital Health Center and Welch Allyn. The energy and sustainability track was sponsored by the Syracuse Center of Excellence. eMinutes partnered with IDEA to offer incorporation services to all RvD IDEA Award winners. SquareSpace, a do-it-yourself platform for building websites, came to Emerging Talk and is offering SU students a free 14-day trial and 50 percent off their first year of SquareSpace service. The Raymond von Dran IDEA provides contacts, resources and funding support for student entrepreneurs. A list of all RvD IDEA and Invention and Creativity Competition applicants can be found at idea.syr.edu/ventures. To learn more about IDEA, email idea@syr.edu.